It is with great sadness we acknowledge the death of Carla Sofia Pereira. She succumbed to breast cancer after many years. We would be hard-pressed to find a kinder or more compassionate individual. Sofia led a life full of adversity. She was born in Portugal, and spent many years with her four younger brothers in an orphanage in Lisbon. She came to the States with the help of her aunt and father when she was 15. Time in the orphanage had given her and her brothers strong moral compasses. She spent years in foster care, with a myriad of experiences, good and bad. She was homeless on the Vineyard year-round for a couple of years. She never let it bring her to the less desirable aspects of life, and remained an upstanding person. She maintained her innocence throughout her life, and always expected people to be as honest and forthright as she was. It did not always work out for her benefit. Through her trials she never became jaded or bitter; her positive outlook was infectious to others. Many people found her refusal to engage in self-pity or anger, given her illness, an inspiration. Sofia was honest to a fault. She spoke four languages, and because of her honesty sometimes had to be reminded that the command of a language means knowing when to say nothing. She had no malice in her heart, but was very capable of expressing herself when hurt or wronged. In high school they tried to teach her culinary arts; they missed the boat. She maintained a strong, natural, almost childlike curiosity about the world around her. When shown, there was little she could not grasp. She had an innate intelligence and worked to expand it. She was a trained CNA. Born a Catholic, she adopted the Baptist faith. She was very knowledgeable about the Bible and could recite many of its passages. She was very beautiful inside and out. She never used her natural beauty for her advantage, and always tried to uplift people who struggled with their lot in life. Most people who met her were quick to realize the unique person she was. She will be missed by many. She leaves her father, Antonio Pereira of Fall River. She is survived by her sister, her four brothers, nieces and nephews, and aunts and uncles. 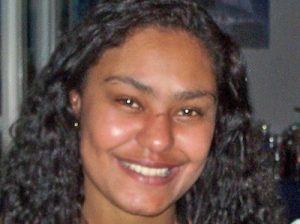 She was well known in the Brazilian community on the Island. She had many friends down-Island, and was loved by many up-Island. She leaves Russell Smith, of the Island, who was her longtime partner. She had many friends in Florida, where she spent the past few winters. We will lessen our loss by remembering our good fortune that she was a part of our lives. God bless her. Donations can be made to the Animal Shelter of Martha’s Vineyard in her name and memory. Thanks for a wonderful homage to an unusual and courageous Islander. May she travel well.